When nine Catholic activists seized and burned draft files on May 17, 1968, they committed an act of conscience that continues to transform lives and inspire action. It was a big moment. More than a hundred people watched as a college professor held one end of a heavy vinyl cover, helping an 88-year-old woman, pull it from the top of a tall metal sign. Together, they unveiled a familiar looking historic marker — the kind that draws attention to battlefields drenched in centuries-old blood and the birth places of famous men all over the country. The 88-year-old woman was Marjorie Melville — one of those nine Catholic activists and, along with George Mische, one of only two still living. In its few sentences of block letters, the historic marker only mentions “priests Daniel and Philip Berrigan” by name. It doesn’t capture Melville’s motivation to join the Catonsville action and draw attention to U.S. military involvement in Guatemala as another Vietnam. She and Thomas shared their experiences in that Central American country in searing testimony captured in my uncle Daniel Berrigan’s play, “The Trial of the Catonsville Nine.” The Melvilles brought John Hogan — a former Maryknoll brother who they had served with in Guatemala — into the action. Mary Moylan, another one of the nine, had been a nurse in Uganda, while George Mische had worked in the Dominican Republic. They all said that part of their radicalization, part of the journey that led them to Catonsville, was a result of seeing the far-flung damage wrought by U.S. foreign policy. David Darst, a Christian brother, and Tom Lewis, an artist and recidivist, had both lived in the inner cities and saw a less exotic version of the same brutal dynamic. The hallmark of so much of our political expression is reactive outrage. It was then too. “Hell no, we won’t go,” was a slogan to be chanted by the young men who were drafted. There is so much to be outraged about, and our outrage matters. But the members of the Catonsville Nine were not outraged. And their action was not a response to the massacre du jour, but to the whole of U.S. foreign policy. As John Hogan said at the trial, “I just want people to live. That is all.” And it was not carried out by those most affected by the draft. In fact, every member of the action was personally exempt from military service by their age, gender or profession, as priests and brothers. It was nine people stepping out of comfort and into commission and conscience. I don’t have any recollections of the action, since I wasn’t born until six years later. My father also wasn’t one to sit around and tell the peace movement’s “war stories.” But I learned the lasting impact of this one action by listening. Strangers would come up to my father — men of a certain age — while he was pumping gas, buying a newspaper or attending a demonstration to confirm his identity and then share some version of this: “I’m alive today because you destroyed my file. My card was at Catonsville. I was about to be sent to Vietnam. Thank you.” My father would accept their thanks with discomfort and pride. Now, from a greater distance, I can understand the discomfort as part of a veteran’s process of atonement, a life saved from war after so many lives lost in war, and an affirmation of the path — narrow, rocky, grueling and lonely — that he had chosen for himself. And then there were the friends, fellow community members — people as close as family. One was a young mother on Long Island, raising five boys. On May 17, 1968, she was sitting in her kitchen, listening to the radio, busy with some household task. The news announcer reported that nine Catholic antiwar activists were arrested after destroying draft records. She was a devoted Catholic, and this was an action involving two priests, a brother, a former priest, a former nun and four lay people. “I was sitting down, and I stood up. I haven’t sat down since,” she said. She went on to be a Catholic Worker, peace activist and a dear friend. I have heard that story countless times, from her and many others who were similarly catalyzed into activism by the Catonsville Nine. From the Camden County Detention Facility in Woodbine, Georgia, she sent me a statement to share with those who gathered in Catonsville for the unveiling: “May the disarmament continue.” This was in keeping with the message the Kings Bay Plowshares carried onto the naval base, which read, in part: “We come in peace on this sorrowful anniversary of the martyrdom of a great prophet Martin Luther King, Jr. Fifty years ago today on April 4, 1968 Dr. King was assassinated in Memphis, Tennessee as a reaction to his efforts to address the ‘giant triplets of racism, extreme materialism and militarism.’ We come to Kings Bay to answer the call of the prophet Isaiah to ‘beat swords into plowshares’ by disarming the world’s deadliest nuclear weapon, the Trident submarine.” For this action, they face more than 20 years in prison. It seems like a very long time. 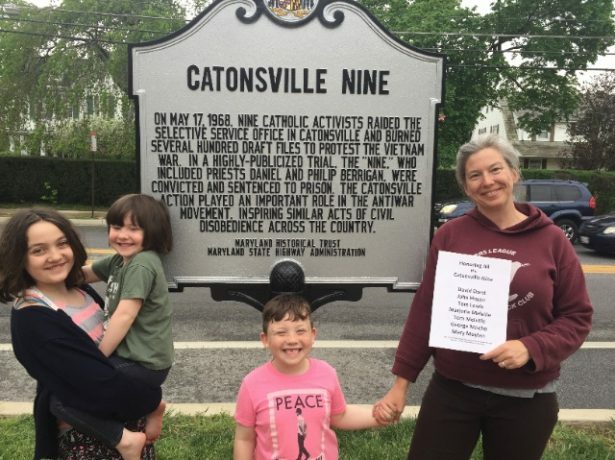 Action, community, collective courage — that’s the spirit of the Catonsville action. It is a way of survival. It tells us our souls are our own. So, thank you, Brother David Darst, John Hogan, Thomas Melville, Marjorie Melville, George Mische, Tom Lewis, Mary Moylan. Thank you Uncle Dan. Thank you Dad. And thank you, Kings Bay activists, friends, family: Martha Hennessy, Clare Grady, Father Steve Kelly, Patrick O’Neil, Mark Colville, Carmen Trotta. Thank you, Mom. Thanks Frida for this article. I grew up in this area and this was my draft board. While I was 4F I didn’t have to worry about being drafted, but I am grateful that many of my friends are alive because of this action. Good Morning, Clint. Thanks for taking the time to share this! Peace! dear wagbg nbon viuolence- why make it difficult???????????? Today, as I celebrated Eucharist with my parishioners, I reflected on the scriptures and felt a profound connection between the choices that the Kings Bay Plowshares made and the choices made by Paul and Jesus. In his “high priestly prayer” in John 17, Jesus reveals the heart of the gospel in his intimate desire for his disciples to “be one even as we are one.” This revelation speaks of a world already in a profound state communion: sea, air, land and creatures all sharing a delicate biosphere, exchanging energy and life, abiding in a marvelous community of interbeing. 99% of creation is complete. 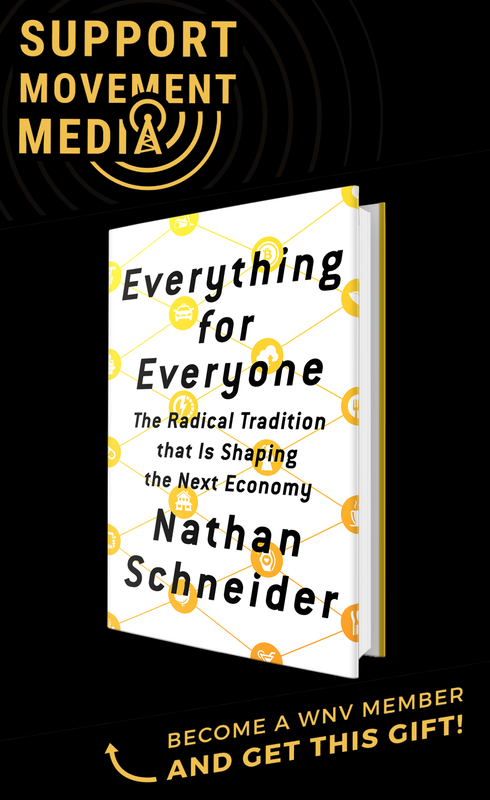 What remains to be done is the conversion of stubborn wills of individuals and tribal groups that rebell against the common good through the conspiracy of racism, militarism and extreme materialism. Jesus is consecrating himself in truth as his lays down his life to defeat these powers of evil. I believe that to be the same intent of the Plowshare activists, to say no to the system of legal oppression and evil that Trident represents. The commitment to use these weapons is an immoral posture condemned by the gospel and the teaching of the Catholic Church. Our friends in the Plowshares movement are taking personal responsibility as conscientious citizens and declaring with their lives and their blood, saying “yes” to the security of our global village, yes to the community of life, yes toEucharist, yes to the words of Jesus, “we are one.” By saying “no!” to Trident’s commitment to take life indiscriminately from all of creation, they are saying “Yes!” to the God of life, and to the body of Christ. Paul also is caught in the quagmire of partisan politics in the first reading as he listens to the Spirit of Jesus calling him to resist empire and say yes to the communion of Christ’s body. His day in court puts him on a path of imprisonment for the rest of his life. Certainly we think that normally choosing to spend time in jail is not a very effective way to be an evangelist. But the Spirit of Jesus has chosen him to move on his final missionary journey all the way from Jerusalem to Rome, proclaiming the gospel of life for all God’s children. I can’t help but feel that our Plowshare friends are trying to do something in line with Paul and Jesus. I wen t to the Catonsville Library this evening to get a library card, having recently moved into the area. I saw the group of people gathered outside for the 50th anniversary and was curious. I saw a banner reading “Veterans for Peace” and asked what sort of organization that was. I too am a veteran, but am absolutely horrified by what is going on today. I stayed for a good hour, listening to the talk and getting more and more interested. Well, it wasn’t long before I was sold. I stayed for the duration of the commemoration, and went home and immediately signed up to join Veterans for Peace. The Lord works in mysterious ways. Why did I choose tonight to get a library card? In WWII it seemed like many gave up their religious exemption and went to prison against the war. Maybe not “many” but significant in terms of all who refused.